After doing voice work in the animated series THE JETSONS, Ingle taught acting at Beverly Hills High School in Beverly Hills, CA from 1964 until 1985. Among his better-known students: Meredith Baxter, Richard Dreyfuss, Albert Brooks, Linda Evans, Swoosie Kurtz, Barbara Hershey and Nicolas Cage. Ingle continued to do voice work (SMURFS), and played the school principal in the 1988 cult film Heathers. Ingle took over the role of Edward Quartermaine in 1993 and played it for 10 years, until the show moved him to recurring, prompting Ingle to take the contract role of Mickey Horton on DAYS. Ingle returned to GH in 2006. Ingle took on another series about a sprawling family when he appeared on HBO’s polygamy drama, BIG LOVE. Provided the voice for Maggie Simpson on THE SIMPSONS. Volunteers with the San Gabriel Valley affiliate of Habitat for Humanity. Taught Acting at Beverly Hills High School. Calls former GH co-star Stuart Damon his closest friend. Won Outstanding Scene Stealer award at 1999 Soap Opera Awards. The daytime community has reacted to the news of John Ingle's death. 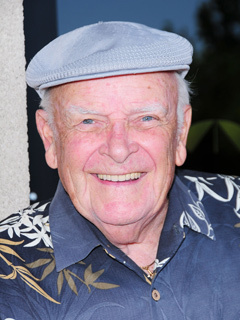 John Ingle, beloved to the GENERAL HOSPITAL audience as Edward Quartermaine, passed away on September 16, just a few days after his final poignant appearance on the show. GH's John Ingle (Edward) hasn't had much story lately but with the advent of the Port Charles Carnival, the Q patriarch is driving all the action ... literally. John Ingle's longevity in the acting world hasn't dampened his love for the craft. While he relishes his full-time gig as the Quartermaine patriarch on GENERAL HOSPITAL, he still craves the challenge and thrill of tackling outside projects. Last season, he had a pivotal guest spot as Ernest Holloway on HBO’s BIG LOVE. Nope, it wasn't a flashback! That really was John Ingle we saw on GENERAL HOSPITAL last week in his triumphant return as Edward, the cranky Quartermaine patriarch.... Here, the actor reflects on returning to the part he played from 1993-2004, and talks about what lies ahead. There were lots of laughs and outrageous responses in Soap Opera Weekly's triple feature with DAYS OF OUR LIVES' Judi Evans (Bonnie), Suzanne Rogers (Maggie) and John Ingle (Mickey). Because of space constraints, however, a few questions and answers didn't make the final edit. Here are some of the hilarious commentary you missed.